Around this time each year we get pretty excited about learning who wins the Young Architects Program competition at MoMA PS1. The NY Times published the news yesterday—the winner is Mexico City-based Escobedo Solíz Studio, a young practice directed by Lazbent Escobedo and Andres Solíz. In their work, they rely on an open mind to experimentation, aren’t afraid to question accepted design processes, and take context into account in any particular project they are working on. Intuition drives their work as well. 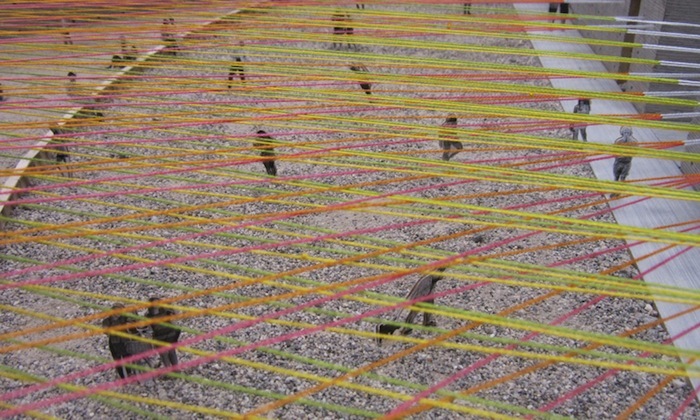 [Weaving the Courtyard] will use the pattern of holes in the courtyard’s concrete walls, formed when the walls were originally poured, as a template for the weaving of a colorful rope canopy — or what the architects call a cloud — over the outdoor space. Underneath the cloud will be embankments with platforms of soil and water and a reflective wading pool in the rear of the courtyard in which visitors will be allowed to dip and cool off. As usual, we can’t wait to see it in person! Congratulations to Ecobedo Solíz Studio for their win, and to MoMA PS1 for continuing to produce this creative, interesting, and thought-provoking competition.